The Obama administration today declined to protect polar bears from the single greatest threat to their survival – the melting of sea ice by global warming. The decision brought immediate protests from wildlife and environmental groups. The interior secretary, Ken Salazar, said he would not overturn one of the most controversial last-minute rules of the George Bush era. The rule had denied protection to the polar bear because Bush did not want to be pressed into regulating the industries that emit greenhouse gases. 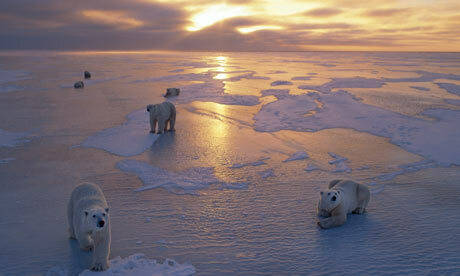 “To see the polar bear habitat melting and an iconic species threatened is a tragedy of the modern age,” Salazar said. But he said existing wildlife legislation, which was crafted in the 1970s, was not equipped to deal with threats to the polar bear from heat-trapping pollution occurring miles away from its Arctic home. “The endangered species act is not the best mechanism for cutting down on climate change.” He said it would be far more effective to work towards a comprehensive strategy on climate change – which he said the Obama administration and Congress were pursuing as their “signature” issue. “We need a comprehensive energy and climate change strategy that curbs climate change and its impact, including the loss of sea ice,” he said. Although many legal scholars signed onto earlier rulemaking comments to the contrary, there are also impeccably environmentalist scholars such as J.B. Ruhl who view the ESA as an inappropriate tool to address climate mitigation. Some of the other writers for this blog have more expertise than I do on the ESA, so I’ll leave the task of deeper analysis to them.